Buses. Transport with an inferiority complex? Once again, I’ll mention the supposed Thatcher quote about being a failure if you’re on a bus past a certain age. Whether or not she said it, the sentiment rings true for many many people. Ask someone with a 4×4 and personalised reg plate if they’d consider using the bus and you may as well suggest a medieval beheading of their Granny. Of course the whole world of successful bus services is multi-faceted. But, as much as anything in Britain in 2014, “coolness” is everything. I considered this yesterday as I watched the brand new Arriva Sapphire double deckers in Llandudno. Sparkling in the seaside sunshine, it might have only been their first week in service, but the Stenning-designed livery is a show stopper. I watched other people who, on the whole, were normal citizens. Not the bus geek obsessive I am. And they too were looking at them. Add in free wifi and comfy seats, etc and you have the basis of “cool”. Now if only we had an American rapper or mega-star proclaiming the delights of buses, we’d be made. It worked with Snoop Dogg and car insurance. Sapphire is rightly recognised as being one of the premium offerings the bus industry can offer. But what about the 99% of the rest on offer? I was sat in roadworks on a housing estate in Gornal earlier. My bus a typical round the houses affair. I actually read what was on the cove panels. Ads for National Express West Midlands Travelcards (fair enough) but a depressing one about bladder control and PPI claims. You can just imagine the meeting at the advertising company. 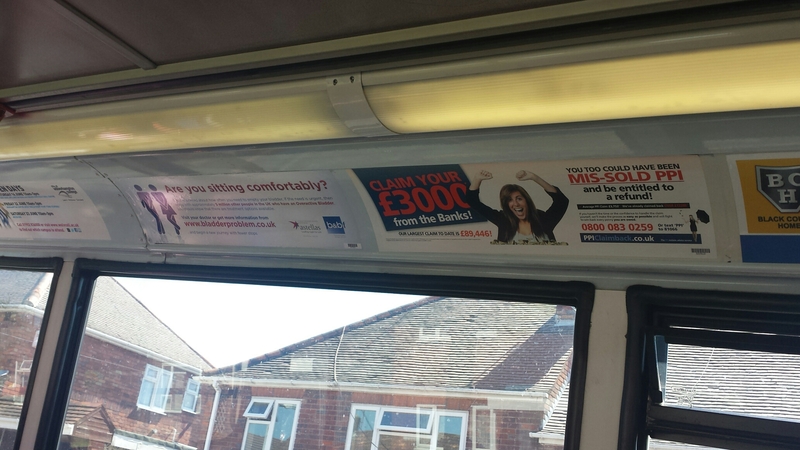 We’ll stick the bladder ads on buses because they’re full of…er….older people who might have this problem. A “win-win” in management-speak. Advertisers pay up, “target audience” sorted, box ticked. I appreciate the need to get the message to “target audiences”. Just how do you raise awareness of products unless you point them at “target audiences”? With daytime buses carrying lots of concessionary pass holders, it’s an obvious choice to use buses to interact with potential users of such a product. And yet, although I could simply look away and ignore it, it certainly wasn’t “cool” (if that’s the right term) for me. Bus operators might be getting valuable income (as they do for bizarrely advertising cars on buses) from this, but public transport needs, in my view, to sharpen it’s message. Now of course I have every sympathy for people with medical conditions – and it’s a challenge to reach out into the community and raise awareness of how sufferers can get help. But in what other environment do you see such advertising? I’ve only seen similar in my local GP surgery (which has no aspirations to be “cool”). I haven’t seen bladder control ads in Tesco, the pub, the High Street or anywhere else – except buses. Advertising of any sort on buses has been there forever. Since horses pulled them. But I have more respect and admiration for bus operators who relentlessly and confidently sell themselves. Brighton & Hove springs to mind (although did I hear they are about to start accepting ads again?) as did Sapphire. Here are operators who are saying “this is us, we’re providing a great service, and you should be on here”. Whereas too often, the message is, “we’re mundane, you can use us if your car has broken down or if you aren’t able to drive at all”. So we arrive back at the usual conclusions. Give the bus priority to make it reliable, make it safe and reasonably priced, add in little extras like wifi (motorists can’t update Facebook on the move like bus users can) and sell it as a complete package that oozes confidence in the product. It’s all about the perceived message. Having waxed anything but lyrical previously about the saga of the rarely-working “totem” (geek-speak for posh bus stop), I’ve just been munching over a coronation chicken sandwich in Pret-a-Manger in Colmore Row Brum using the National Express West Midlands app to see if it will correctly predict the arrival of the 140. It’s only every 30 minutes, so the app might do a decent job here of predicting how fast to eat my sandwich. It faultlessly counted down to 4 minutes when I decided to amble out to the stop – and there, with the word “due” on my phone, it appeared. Top marks then to NXWMs bit of technology. But what of the totem? 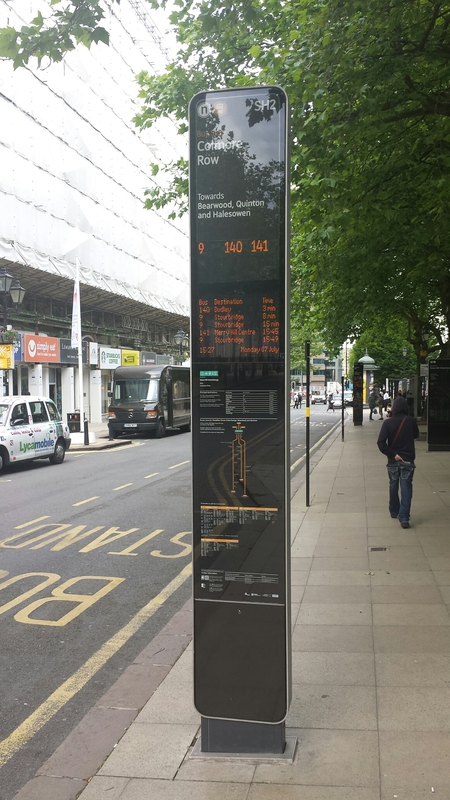 When I was last here a few weeks ago it had died an electronic death, which was about the same use as when it was displaying completely false information. Today, it was back on, and supposedly showing “real time”. It too correctly predicted my 140’s arrival. An inner “whoop” erupted (although that could have been the effect of the coronation chicken). I’d like to think, finally, a golden age of technological joy has descended upon the totems of Brum. And it’s only fair that, having ranted about their uselessness in a previous age, I report something good about them when I see it. Or was it just guesswork that got lucky with an on time bus?